Structural studies in the Late Riphean to Vendian succession of the southeastern part of the Trollfjorden-Komagelva Fault Zone on Varanger Peninsula, Finnmark, have revealed the presence of two main sets of contractional structures, here grouped into D1 and D2 events. These folding and cleavage-forming episodes are superseded by two, separate extensional events, D3 and D4. Although only one of these four events (D3) has been directly dated in the actual study area, the probable ages of the disparate, contractional deformation episodes can be deduced from published geochronological data in neighbouring parts of Varanger Peninsula or Northwest Russia. The deformation history of this area shows the following sequence of main events: (1) Inversion of the pre-existing, Neoproterozoic, basinal regime occurred during an episode of SW-directed shortening, folding and associated cleavage development, with reverse faulting and minor sinistral strike-slip movements along the Trollfjorden-Komagelva Fault Zone. By comparison with the situation on the nearby Rybachi and Sredni Peninsulas in NW Russia, this D1 deformation and low-grade metamorphism is likely to have occurred during the Timanian orogeny at about 570-560 ± 10 Ma. 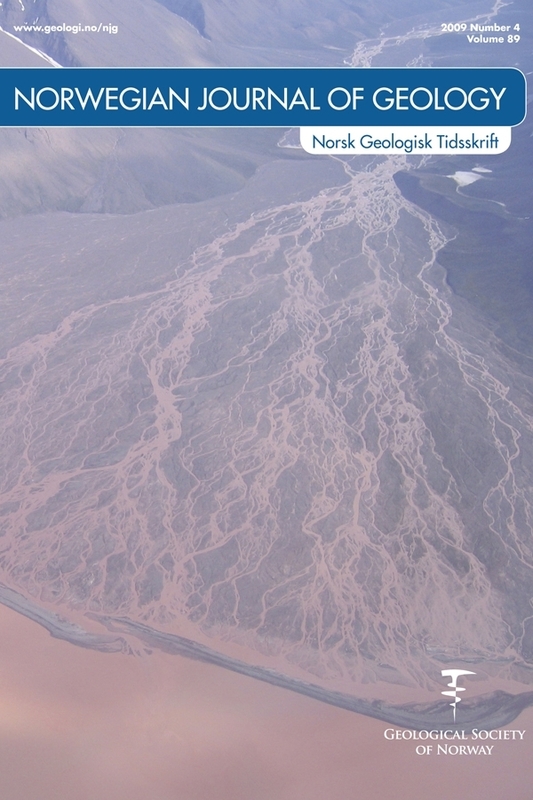 (2) The D2 event represents the main Caledonian deformation and is characterised by SE-directed shortening (NE-SW-trending folds and NW-dipping cleavage) that gave rise to a moderate dextral strike-slip displacement along the Trollfjorden-Komagelva Fault Zone. Based on recent geochronology from NW Varanger Peninsula, this major contractional, epizone event is considered to be late-Finnmarkian, c. 470-460 Ma. It is likely that Siluro-Devonian Scandian deformation in the study area and along the fault zone was largely of brittle character. (3) A regional, extensional event, D3, is reflected in N-S fracturing and dolerite dyke intrusion. The dyke intrusion is dated to Late Devonian time at c. 375-370 Ma. (4) A younger extensional event, D4, is manifested in dip-slip normal faulting along and adjacent to the main fault zone, with breccias, gouge and quartzcalcite veining. The age of this episode is open to speculation – from Carboniferous to Cretaceous – but a Mesozoic reactivation seems highly likely based on our knowledge of offshore geology.